The Trading Post trail is located in Red Rocks Park near Denver, Colorado. 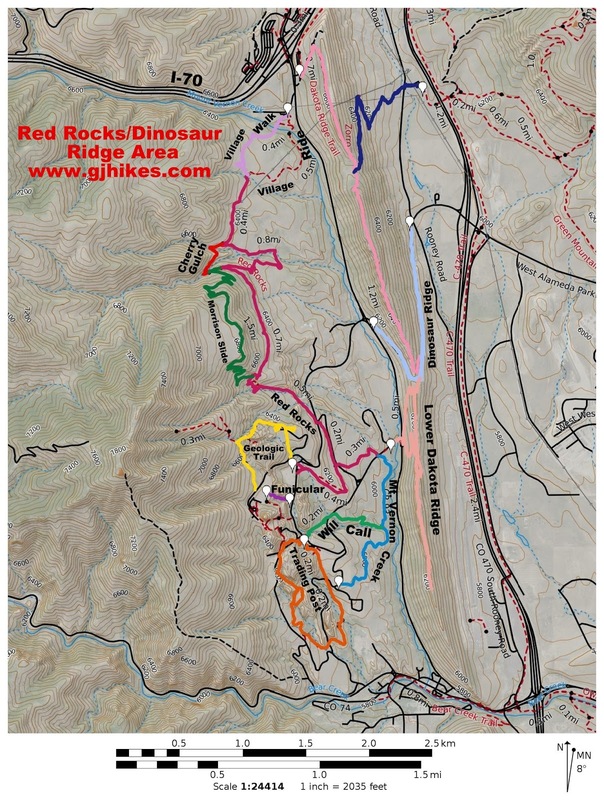 The trail begins at the Red Rocks Trading Post where it travels south past Picnic Rock and Cave Rock before looping back on the west side of Frog Rock and between Titanic Rock and Nine Parks Rock. The trail completes its loop by arriving back at the Trading Post. Inside the Trading Post visitors will find a gift shop, cold drinks and the Colorado Music Hall of Fame. The start of the trail is past the restrooms and courtyard on the east side of the Trading Post. From there the route descends a set of stairs where it picks up the trail. Parts of the trail are primitive in nature. A stretch of slickrock serves as the trail as it travels along Picnic Rock. After passing Picnic Rock a set of rock steps leads down to the first of two road crossings. From there the trail courses through meadows and brush where it finds a foot bridge to carry it across a wash.
As the trail turns westward it crosses the road once again where there is another parking area that could serve as another place to access the trail. Grassy slopes border the trail as it heads back to the north sandwiched between the red rocks and the side of the hill. Nestled in a garden like cove near the top of Frog Rock there is an optional loop that can be added to the hike. After passing through an area of thick brush and crossing a small bridge the trail finds another staircase made from slabs of rock to take it up the talus slope on the west side of Nine Parks Rock. As the trail finishes up you can take a stroll around the Red Rocks Native Garden where you can learn about some of the wildflowers that you may have seen along the trail. From there you will pass a statue of John Denver and arrive back at the Trading Post. 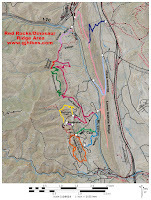 The Trading Post trail is a nice short family hike that provides a close up look at some of Red Rock's best features. It normally takes an hour or less to complete the loop, not that there is any reason to rush. Visitors are expected to stay on the designated trail and not engage in rock climbing. There are benches and other places where you can sit and rest and enjoy your scenic surroundings. If you would like to see it for yourself then all you have to do is 'Take a hike'.